4 July 2013, at 12:00a.m. Pig meat production in the EU is likely to be down for a second consecutive year, according to the latest 'Short Term Outlook for EU Arable Crops, Meat and Dairy Markets' from the European Commission. After two consecutive years of increased pig meat production in the European Union, 2012 marked a two per cent decrease. High feed costs, the restructuring process or the implementation of new welfare rules are the main drivers for such a decline in herd numbers and in meat production. 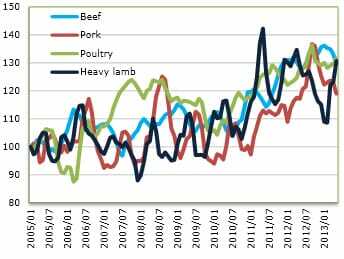 Tight supply conditions are likely to continue in 2013 at a very similar pace (-2.0 per cent) as indicated by the December 2012 survey and by slaughtering data for the first months of the year. The census set the EU live swine herd lower by 1.8 per cent against the previous year at 145.8 million head, driven mainly by the dramatic fall in Poland (-14.7 per cent) and lower numbers in Spain (-1.5 per cent), France (-1.4 per cent) and Denmark (-0.5 per cent). On the other hand, Germany's herd , which accounts for 20 per cent of EU total, increased by 3.4 per cent, partially offsetting the decline in the other countries. As for production, increased slaughterings in Germany (+1.3 per cent) in the first months were not enough to compensate for the declines in Denmark (-7.0 per cent), Spain (-3.7 per cent), France (-2.3 per cent), Netherlands (-5.0 per cent) and Poland (-1.4 per cent). 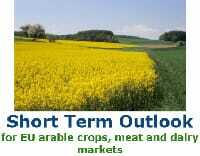 Lower supplies maintained meat prices at high levels throughout the first quarter of 2013 (€172 per 100kg c.w. in March); a slight relief in prices could be observed in May due to sluggish demand but prices started to pick up again in June. Firm prices and limited supply are expected to lead to a decrease in both consumption and exports in 2013. On the trade side, data for the first four months indicate a decline by two per cent in pigmeat exports mainly due to Russia (-2.0 per cent compared to the same period of last year). April EU exports to Russia increased by 27 per cent compared to their respective 2012 figure, in spite of some restrictions introduced by Russia on certain EU meat. In addition, the Russian ban on the US and Canadian pigmeat exports in place since February should favour EU exports into Russia. Nevertheless, and despite the recovery of Russian imports and the increased demand in China (+78 per cent) and Japan (+5.0 per cent) in early 2013, exports are expected to decline by six per cent given the limited supply over the whole year. Projected lower cereal prices on the assumed good 2013 harvest are expected to help increase production and stabilise consumption in 2014. With the accession to the EU, Croatia will add approximately 1.2 million head to the EU total pig herd (December 2012 census), sourcing 86,000 tonnes of meat per year or just 0.4 per cent of EU pig meat production.